Today is quite a milestone for the Google Plugin for Eclipse (GPE). Our team is very happy to announce that all of GPE (including GWT Designer) is open source under the Eclipse Public License (EPL) v1.0. GPE is a set of software development tools that enables Java developers to quickly design, build, optimize, and deploy cloud-based applications using the Google Web Toolkit (GWT), Speed Tracer, App Engine, and other Google Cloud services. Because of the large ecosystem that has developed around GWT, App Engine, and Google’s Cloud services, and because our primary mission is to help users (as opposed to creating proprietary development tools), it makes a lot of sense for us to open source GPE and make it easier for the community to enhance and extend the tools. As of today, all of the code is available directly from the new GPE project and GWT Designer project on Google Code. Note that GWT Designer itself is based upon the WindowBuilder open source project at Eclipse.org (contributed by Google last year). We will be adopting the same guidelines for contributing code used by the GWT project. In the months to come we expect to start bringing on more committers, but don't let that stop you from contributing. The project will only grow with the community's input. Submitting bugs via the issue tracker and engaging with other users on the forums will go a long way towards ensuring the overall quality of the product. Dart and GWT both share the goal of enabling structured web programming. In fact, many of the same engineers who brought you GWT are working on Dart. We view Dart as an ambitious evolution of GWT’s mission to make web apps better for end users, and we’re optimistic about its potential. As Dart evolves and becomes ready for prime time, we anticipate working closely with the GWT developer community to explore Dart. Meanwhile, rest assured that GWT will continue to be a productive and reliable way to build the most ambitious web apps — and even games like Angry Birds. Key projects within Google rely on GWT every day, and we plan to continue improving (and open-sourcing) GWT based on their real-world needs. The Google Web Toolkit team has been asked recently about our plans following the announcement of the Dart programming language a few weeks ago. Pictarine is a photo management web application, launched in 2010, that allows people to easily manage and share all of their photos from Flickr, Picasa, Facebook, Twitter and other sites. 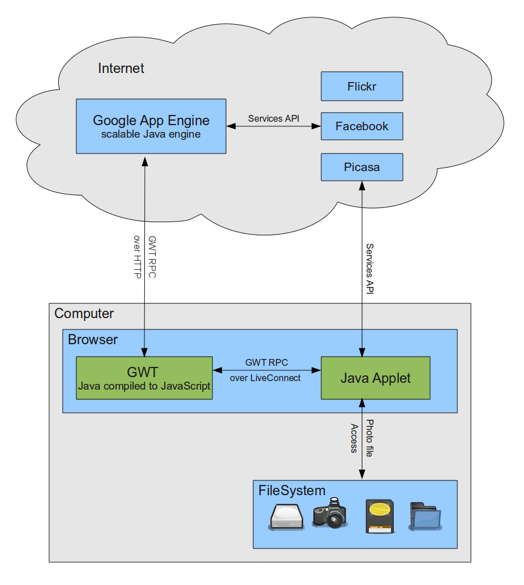 Pictarine developers Guillaume Martin and Maxime Rafalimanana have contributed the following post discussing their experiences using Google App Engine and Google Web Toolkit. From the start, we used Google technologies in developing Pictarine and we wanted to share our experience with them so far. In this post, we will shed some light on the weaknesses and strengths we found in Google Web Toolkit (GWT) and Google App Engine. We will also discuss how we leveraged GWT to build a new technology that allows Pictarine to seamlessly display photos from the computer directly into the browser. The following diagram is an overview of how our application works. The Pictarine team is made of a web designer and two developers who previously worked mainly with Java based enterprise technologies and had a little experience with web technologies. When we started the project in early 2009, we were quite open on learning new languages like Python or Ruby, but when App Engine announced that Java would be supported, we were really excited to give Google App Engine a try. The first few months, learning about the App Engine environment was quite easy and dare I say fun. Testing our code on Google’s servers from Eclipse IDE was only one click away. So we built our first prototype fast and we quickly decided to adopt App Engine. Then we started to build the core of our application: the engine that uses the API from Flickr, Picasa, Facebook to fetch the users’ photos. This is where we hit the first limitations of App Engine. Most users have a lot of photos on these services and retrieving them can take some time. But App Engine has strict limits on how long a request should last: an outgoing HTTP request cannot last more than 10 seconds and cannot process a request for more than 30 seconds. So while building our architecture we found ourselves writing approximately one third of our code dealing with these limitations: paginating our requests, creating background tasks to store data in small batches, etc. In early 2010, when we launched our alpha version, everything went smoothly. We had some good press coverage and App Engine met our expectations in handling our first users. During 2010, we worked on implementing new features requested by our users, and during this period of time we were really impressed by the way App Engine evolved. Many of the limitations were lifted and great new features were added. We are now able to use Task Queues for requests that last up to 10 minutes, which we fully use to sync our users’ photos and albums. One of the features we like the most is the Channel API, a push notification system that allows us to instantly show a photo in every connected browser as soon as it is uploaded. App Engine is still not perfect but has greatly improved and when we see its roadmap, we are quite confident it will continue to improve. What we really like about GWT in our architecture is the ability to share code between client and server: we can use the same Photo or Album class on the client and the server and the GWT RPC system allows us to automatically share the same Java object on both side. We can also have the same data validation code on both sides: we can alert the user immediately on errors and still validate the data on the server just in case. Another great feature we like about GWT is its handling of internationalisation. From the beginning we wanted to build a website available for all Internet users, so supporting English as well as our native language (French) was almost obligatory. Fortunately, GWT makes it really easy to generate centralized localization files so that we just have to translate. 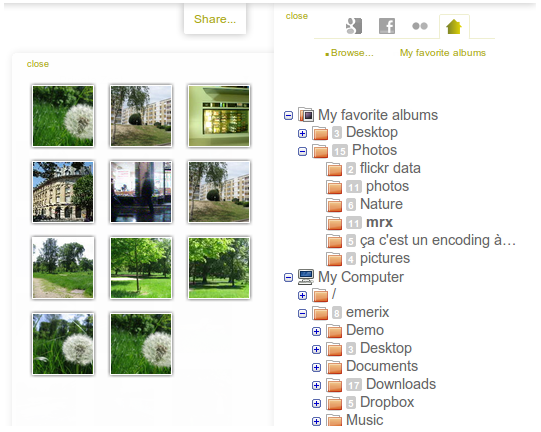 After the launch of our alpha in 2010, our users were able to see and share their photos from Flickr, Picasa, Facebook. But they still had to put their photos on these websites first before coming to Pictarine. This limitation quickly became the first request on our feedback system. We needed to let our users do everything from Pictarine, including uploading photos. Uploading many photos from a website is still not a trivial process. Most websites choose Flash to allow users to upload multiple files at once, but our experience with it was that it often crashed after a while. Some use Java applets, but they are never well integrated and always look odd. At Pictarine we decided to tackle this problem by using Java Applet for their stability across all platforms but without using it to render photos or folders. We have built a technology that uses the GWT RPC mechanism to talk to a Java Applet: photos, upload progression are rendered in HTML/CSS and the applet takes care of photos resizing and uploading. Sharing a photo from a camera is now a one-step process. This technology also allows users to browse their local files directly in their browser and it is fully integrated in our design. We believe that this new use of Java applets can help blur the line between the Desktop and the Cloud by seamlessly integrating desktop files in any web application. In conclusion, we can say that we are really happy with the choices we made with App Engine and GWT. App Engine is a great service that perfectly handled the spike in traffic we saw right after articles on Mashable and Lifehacker were published. So we recommend it to every lean startup out there who loves developing in Java, Python or Go. Cross posted from the Google App Engine blog. In addition, the RequestFactory jars are now in Maven Central. Note that the Maven groupId for RF artifacts differs from the rest of the GWT artifacts since RF can be used in Android clients as well as GWT. If you're using RequestFactory instead of GWT-RPC, you no longer need gwt-servlet. Instead, you can use the much smaller requestfactory-server jar and requestfactory-apt (which contains the RF interface validation tool). You do not need requestfactory-client for GWT projects as the required classes are already included in gwt-user. The requestfactory-client jar is intended for non-GWT (Android) clients using RequestFactory. The mobilewebapp and dynatablerf samples show everything working together and have been tested in Eclipse 3.6 and 3.7. Special thanks to Jeff Larsen for the RequestFactory POM sauce that works in Eclipse Indigo! RequestFactory now does compile-time validation to ensure that your service implementations match your client-side interfaces. This feature is implemented using an annotation processor which must be configured in Eclipse or in your Maven POM. When configured in Eclipse, you will now see warnings and errors in the IDE anywhere your client- and server-side RF code don't match. from this year's Google I/O. and received 48 entries from the US (regrettably, other countries were ineligible due to contest legal requirements). Nine of our ten contest winners provided a little info about themselves, so in no particular order, here they are. Congratulations to all! Web Application Developer for SheepDogInc.ca. We use GWT in lots of ways ranging from full-scale GWT applications to progressive enhancement layers over traditional web applications. Software developer for a biomedical research institution using GWT to develop applications to track DNA sequencing projects. Software developer for a local startup (CorpAv Inc.). We build awesome flight-scheduling software with awesome GWT technologies. We built our application entirely on pure GWT without using any third-party UI library (e.g. Ext-Gwt, SmartGwt) and managed to make it visually-appealing and user-friendly. Web applications developer in the education software field. Our UI team primarily uses GWT for development. Software developer for a network security company. Have used GWT to create small utilities for personal websites. I started out as a Java UI developer and moved into web application development with GWT. Developer at a large Dilbert-style corporation in the finance industry. Been using GWT a little bit at work, and quite a lot on hobby projects. I'm the Director of Engineering at Traction Software, Inc. where we make collaboration software for business. Starting 2 years ago we re-implemented our entire interface using GWT and have shared some of our work in the gwt-traction project. We're huge fans of GWT. 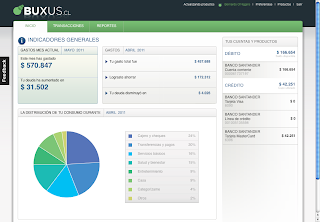 I'm the Chief Architect at Solium Capital, a leading provider of stock plan administration technology and services. 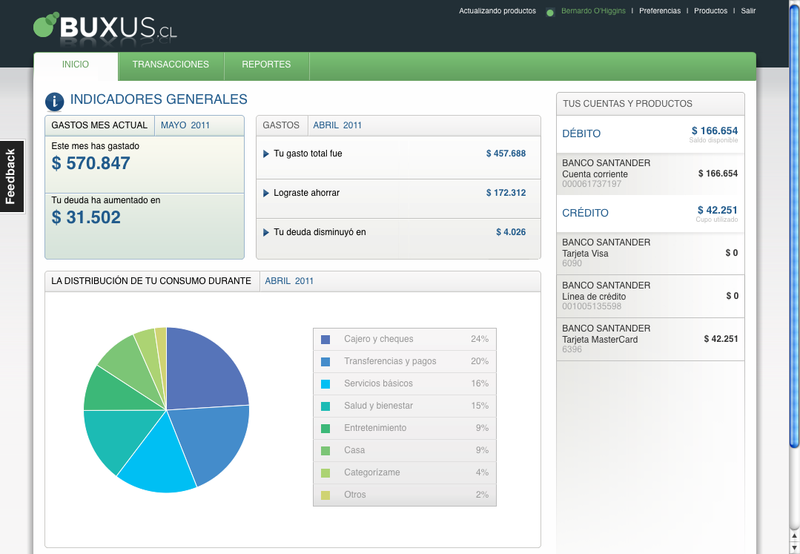 A rapidly increasing portion of the front end of our web based application is implemented in GWT. The results have been tabulated and the winners are in! In Round II of the Last Call for Google I/O GWT contest, we asked contestants to implement a countdown clock in GWT similar to the official Google I/O countdown and received 48 entries from the US (regrettably, other countries were ineligible due to contest legal requirements). Wizards. It's easy to create your first GWT+GAE project. Click File | New | Web application project and you'll get a sample app that you can run locally to kick the tires and then deploy to Google App Engine. Beyond creating a new project, there are wizards to create new UiBinder templates, ClientBundles, GWT modules, and entry points. To use the wizards, click File | New and look for the items with the GWT toolbox logo (or click File | New | Other... and browse to the Google Web Toolkit folder). GWT Designer, now bundled with GPE, lets you quickly create a GUI. To see it in action, create a class that extends GWT's Composite class, then right-click on the file and Open With | GWT Designer. When the editor opens, click on the Design tab at the bottom. After GWT Designer launches, click a tool on the palette (say, LayoutPanel), then click on the empty design window to drop the widget in place. Click the source tab to see the code that GWT Designer wrote for you. It's a great way to learn the new cell widgets like CellTable and TextColumn, and GWT Designer has a built-in WYSIWYG CSS editor, too. Quick fixes and warnings help you write good GWT code quickly. For example, when you create an interface that extends GWT's RemoteService class, GPE will prompt you to create the corresponding async interface required for GWT-RPC. Just click Ctrl+1 (Quick Fix) on the red squiggly and away you go. Dev mode integration lets you test your code quickly. Run As | Web Application starts GWT development mode and the App Engine dev server (if applicable) so you can test your code in the browser. When dev mode starts, look for the Development Mode tab in Eclipse and double-click the URL to launch your app in the default browser. With GWT dev mode running, you can make changes to your Java code, hit Refresh in the browser, and see your changes live. Debugging in dev mode rocks. Set a breakpoint in Eclipse, right-click on your project, and Debug As | Web Application. Switch to the browser and run your code. Eclipse will open the Debug perspective where you can step through your code line-by-line, inspect variables, etc. One-click deploy to Google App Engine. Just click the Google App Engine logo on the toolbar. Maven support. GPE works with Maven projects via m2eclipse (see setup instructions). Check out a Maven project like the Expenses GWT+GAE sample app into your workspace, then click File | Import | Existing maven project and point it to the pom.xml file. Maven will download all the jars and plugins required in the POM, and GPE will configure the project with the GWT and/or App Engine SDKs from the POM. You can then run Maven commands externally or Run As | Web Application in Eclipse. Testing. Run As | GWT JUnit Test lets you easily run test cases that extend GWTTestCase. SpeedTracer. You can launch SpeedTracer from within Eclipse. Click the green stopwatch icon on the GPE toolbar. GPE will compile your app, run it, and launch SpeedTracer in Chrome to profile your app. Haven't tried it yet? Install Google Plugin for Eclipse now. As I speak at JUGs and conferences around the world, I'm often surprised that some folks have never seen some of the best features of Google Plugin for Eclipse, such as using the Eclipse debugger with a GWT app. So in no particular order, here are 10 reasons you should use Google Plugin for Eclipse (GPE). GWT+GAE made easy. GPE is the easiest way to get started with GWT and Google App Engine (GAE). Just check the SDKs box when you install the plugin through the Eclipse update site. It's easy to upgrade the SDKs this way (Help | Check for updates), and a status bar message in Eclipse will remind you when new versions are available. To participate, see the official Last Call for Google I/O blog post. The GWT / Developer Tools contest opens Wed Mar 25 at 9am PST. We want to be able to make CSS changes without recompiling or redeploying the app. The only way to satisfy the above two constraints is to have all the customization work happen in simple HTML/CSS files that live outside the GWT project and WAR directory. This allows the customizer to work in pure HTML/CSS, directly with the files on the server, without ever having to modify the internals of the GWT application. Changes can take effect immediately, without a need to redeploy the app. Another challenge for us was the need for the application portion of the booking engine to be able to be dynamically resized relative to the user's browser. To accomplish this, we decided to use a DockLayoutPanel, which handles the separation between the main application and the custom frame. We load an empty SimplePanel into each of the North, South, West, East sections of the DockLayoutPanel, and our application in the Center. Next, we add special code that runs directly from onModuleLoad() that scours the host HTML document for four DIVs with 4 unique ids: tt-Header, tt-Footer, tt-EastSidebar, and tt-WestSidebar. If the app finds a DIV with those ids, it loads it into the corresponding SimplePanel and auto-sizes to the contents. If no corresponding DIV is found, the app hides the SimplePanel entirely and sets the width or height to 0. Here again, we had to come up with a custom solution. To avoid the recompile/redeploy issue and also to keep it simple for the customizer, we had to handle the CSS for customizing the application without having to modify any code inside the GWT project. UiBinder - Any time we needed to use a CSS style to adjust the size or layout of a widget or panel, we kept that CSS code in UiBinder XML. We only want the actual GWT developers to change the layout/size of the UI elements, so they needed to be in a sense “hidden” from the customizer. We loved how the default UiBinder behaviour is to generate md5 class names, allowing us to create lots of custom CSS rules, without worrying about namespace overlap and also ensure that the customizer would know not to override them. master.css - Next, we created a "master" CSS file where we put all the other CSS styles, which we thought were fair game, to be overridden by the customizer. This is a huge CSS file, but when minimized (yuicompressor) and gzipped, the end result was still better than the latency hit we had when originally we tried to spread these across multiple files (for organizational purposes). Note that the master.css file is loaded directly from the main HTML file. designer.css - The final layer is the "designer" CSS, which is where we have the customizer put all the CSS rules which override the defaults. The class names in this file all match the class names in the master CSS, but since we load the designer CSS in the page *after* we load the master CSS, the former will always override the latter. Despite our constraints, we were able to configure our GWT application to perform exactly as we desired. Our application is fully customizable, both in terms of the surrounding frame layout and also the internal application's colors and fonts, all without the customizer having to know any Java or GWT. By carefully separating the different layers of the app, we were able to make it easily and efficiently customizable on the fly, without ever having to redeploy the application. There's more than one way to skin a GWT app. In this guest blog post, Erik Uzureau, User Experience Engineer at TravelTripper, shares their approach. At TravelTripper, we make hotel reservation software. Our main product is a "booking engine" called RezTrip, a web based application that allows visitors of a hotel’s website to directly book a stay with that hotel. As GWT applications go, we think RezTrip, when it comes to the question of styling, presents an interesting departure from traditional development. As a "white label" application, we needed to create our app in such a way that allows our hotel clients the ability to customize not only the "frame" around the application, but also the internal style of the application itself, such as fonts, colors, etc. In other words, each hotel needs the ability to create their own custom header, footer, or sidebar and have it wrap the booking "application" portion of the page. Furthermore, each hotel needs to be able to change all the colors, fonts, and even some icons within the application. The desired end result is a single booking engine application, running on multiple web sites, but always mimicking the look and feel of each individual hotel site. Cost - While our first priority is building a system with ultimate flexibility, the time spent to create each customization represents a direct bite into our profit margins. The business guys were explicit about keeping these costs to a minimum. Dynamic Changes - Clients are naturally picky about the appearance of their website, and their tailored booking engine is no exception. Experience told us that we would be fielding constant requests to tweak different aspects of the customized properties. This has to be easy to do and have minimal impact on the overall site performance. Our in-house GWT team is top-notch, but expensive. The previous version of our application was built on basic JSP/HTML/CSS technology, and the customization work had been done by a more affordable entry-level web designer. Similarly, for this version of the application, we wanted to limit the involvement of our GWT developers as much as possible, where possibly leaving stylistic tweaks to our web designer. We want the customizer to be able to do *all* the work, without requiring any Java or GWT knowledge. We realized that GWT's application compilation philosophy changed a lot of our longstanding web development assumptions. We didn't want to create custom UiBinder files for each hotel's frame, or have to make spot changes to CSS that would require a full recompile and redeployment of the application. and GWT 2.2 are now available with several new features that we’re excited to share with you. First, Google Plugin for Eclipse 2.2 directly integrates GWT Designer, a powerful WYSIWYG Ajax user interface (UI) designer that makes it much easier to quickly build UIs. Second, developers can take advantage of the modern web with the first round of HTML5 support within the GWT SDK. Additionally, GWT’s CellTable widget now offers new functionality, such as default column sorting and the ability to set column widths. These new features make it even easier to build best in breed web apps using Java-based tools and Eclipse. And while these apps can be run on any platform, Google Plugin for Eclipse makes it very easy to deploy, and run, on Google App Engine. Instructions for installing this new release of the Google Plugin for Eclipse and GWT SDK can be found here: Getting Started with Google Plugin for Eclipse. If you’re simply looking for the GWT 2.2 SDK, you can find it here: GWT SDK Download. Directly integrating GWT Designer into the Google Plugin for Eclipse has been a top priority for us over the past few months. We’ve had some very positive feedback from the community early on, and for this release we not only wanted to provide the best developer experience when using GWT Designer, we also wanted a seamless experience across GWT Designer and GPE. GWT 2.2 includes support for HTML5-specific features, such as the Canvas element, which allows for dynamic, scriptable rendering of 2D shapes and bitmap images, and the embedding of Audio/Video tags. These APIs are still experimental and may change a bit over the next couple releases, but we feel that they're stable enough to deserve some real mileage (by you). One of the GWT team members, Philip Rogers, put together this demo to showcase the new Canvas support in the GWT SDK. You can find the code for this demo here: http://code.google.com/p/gwtcanvasdemo/. With GWT 2.1, we found that developers were often times incorporating a CellTable widget into their project, and immediately adding the boilerplate code to add sorting, and then having to jump through hoops to set column widths. With the GWT SDK 2.2 release, this functionality is now part of the CellTable widget itself. Where we can, we want to improve the native GWT widgets, adding features and functionality that minimize the custom code that developers have to write. If you would like to see these updates in action, checkout out the CellTable example with the GWT Showcase app. GWT version 2.2 will only have deprecated support for Java 1.5, resulting in warnings when building applications. While Java 1.5 will still work for this release of GWT, developers should upgrade their version of Java to correct these warnings and ensure compatibility with future versions of GWT. If you have questions or want to provide feedback, we’d love to hear it, and the best place to do so is in the Google Web Toolkit Group. Google Plugin for Eclipse and GWT 2.2 are now available with several new features that we’re excited to share with you. First, Google Plugin for Eclipse 2.2 directly integrates GWT Designer, a powerful WYSIWYG Ajax user interface (UI) designer that makes it much easier to quickly build UIs. Second, developers can take advantage of the modern web with the first round of HTML5 support within the GWT SDK. Additionally, GWT’s CellTable widget now offers new functionality, such as default column sorting and the ability to set column widths. These new features make it even easier to build best in breed web apps using Java-based tools and Eclipse. And while these apps can be run on any platform, Google Plugin for Eclipse makes it very easy to deploy, and run, on Google App Engine.